Polyhedral techniques for program transformation are now used in several proprietary and open source compilers. 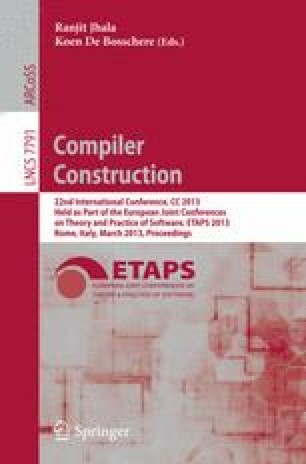 However, most of the research on polyhedral compilation has focused on imperative languages such as C, where the computation is specified in terms of statements with zero or more nested loops and other control structures around them. Graphical dataflow languages, where there is no notion of statements or a schedule specifying their relative execution order, have so far not been studied using a powerful transformation or optimization approach. The execution semantics and referential transparency of dataflow languages impose a different set of challenges. In this paper, we attempt to bridge this gap by presenting techniques that can be used to extract polyhedral representation from dataflow programs and to synthesize them from their equivalent polyhedral representation. We then describe PolyGLoT, a framework for automatic transformation of dataflow programs which we built using our techniques and other popular research tools such as Clan and Pluto. For the purpose of experimental evaluation, we used our tools to compile LabVIEW, one of the most widely used dataflow programming languages. Results show that dataflow programs transformed using our framework are able to outperform those compiled otherwise by up to a factor of seventeen, with a mean speed-up of 2.30× while running on an 8-core Intel system.